Age spots? No problem. Sun damage? Piece of cake. Using SmartPulse technology, the IPL delivers direct bursts of energy on to the targeted areas of the skin. The IPL targets these as well as rosacea, hyper-pigmentation, vascular lesions and much more. Photo skin rejuvenation causes collagen and blood vessels to constrict, reducing redness and age lines with minimal discomfort and minimal risk of side effects. The Venus Versa IPL Applicator delivers blue and red light simultaneously. While the blue light is destroying acne-causing bacteria, the red light is reducing inflammation and promoting faster healing. Sometimes, in the winter especially, our skin dries out, and we feel a little chapped. With The Naked Truth’s brand new Venus Glow TM we can put back that moisture while exfoliating your skin and quite literally sucking out the bad and infusing the good. 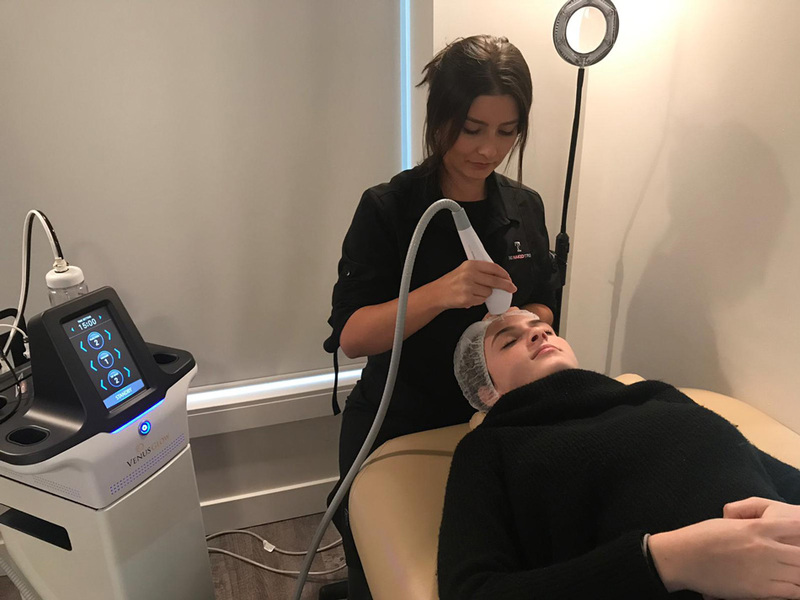 The Glow Hydra facial is a dermal rejuvenation solution that provides a deep cleansing treatment meant to enhance the skin’s overall tone by removing dead surface cells, oils, and debris, and clearing away clogged pores and sebum to reveal healthier, radiant skin. It quite literally leaves you glowing. It also prepares the skin for optimal penetration of skin care ingredients and treatment products. Try our hydra facial on it’s own or combine it with an IPL or a skin resurface for an over all over haul of your skin. Do IPL Photofacial treatments hurt, and how long will it take? There may be some mild discomfort but nothing most people can’t easily tolerate. Treatments can take as little as 30 minutes to 90 depending on the treatment and the area. It depends on the treatment. For sun damage and brown spots like freckles, they tend to get darker for a few days before they scab and start to fall off. For veins, the skin may look more red for a few days but make up can be applied directly after the treatment so long as it is applied and removed gently. Each package or session is tailored to suit your needs. Prices range based on the treatment and the area. Typically, the starting cost is around $200 per session. Please phone and set up a consultation so a specialist can tailor a package that works for your needs. How long does it take to get the results I am looking for? Some people are pleased with the results after the first treatment and don’t feel the need to return for more but the average number of sessions for the desired results is three. This is highly dependent on your skin care regime.. If you were treating sun spots and find yourself back in the sun without adequate SPF protection the spots will return. Please talk with our specialists about post treatment and proper skin care. We carry a range of professional products to assist with maintaining good skin health. Do I have to miss any work for the treatment? No, absolutely not, there is no down time for recovery and we keep open late most nights so you can schedule your treatments in the evenings.